Home / Enough 14 Info Café / Riot Turtle in the Enough 14 Info-Café: What was that tree from #HambacherForest doing in a meeting of the Coal Commission? Published by Enoungh 14. Written by Riot Turtle. First things first: The Enough 14 project has a legal issue about the original name of the project. Although it looks like the Enough 14 project was founded earlier, another project claims it registered a patent on the name Enough is Enough and threatened the enough 14 project with a lawsuit. The enough 14 collective discussed the matter and decided that since we don’t care about labels it doesn’t make sence to start a legal battle about a name or label. At the moment the name is being changed in Enough 14 on all communication channels. It will take some days until we have finished that work. The Enough 14 collective is discussing a statement for the coming week. But back to the exiting first month of the Enough 14 Info-Café in Wuppertal. After a great opening day on December 22, thanks to the many people that came to visit the new free space in Wuppertal, we had a lot of visitors that live in the Elberfeld-North district in Wuppertal. This was important for me, and the other members of the Enough 14 collective because one of the main goals of the Info-Café is to have a daily anarchist and antifascist presence in the neighbourhood and to have more contact with neighbours on a daily basis. A place weher people can meet each other without being forced to consume. In the Elberfeld-North District the fascists aren’t very strong but its important to keep it like that and the daily contact in the Info-Café with people who live in the neighbourhood is one of many ways to keep the fash out. Many people brought stuff to the free shelf in the Info-Café and many people took stuff out. Nobody is forced to consume something and the possibility to drink tea for free (People CAN donate for their tea but don’t have to) was well received from neighbours and other people that came to the Info-Café. On January 4 there was a screening of Sub Media’s Trouble 16: “Conspiracy to Riot – The case of the J20 resistance”. One of the people that came to the screening lives in the US and took part in the J 20 protests. After the screening there was a good discussion about the J20 and the wave of solidarity. People also discussed the G20 in Hamburg and the repression and solidarity after the protests against the summit. We spoke about the difference between resistance that was build up in many years, like for instance in the Hambacher Forest, and “events” like the G20 in Hamburg. A few days later there was a screening of the 90 minutes long documentary “Beyond the Red Lines – System Change instead of Climate Change”. After the screening we discussed about the Climate Justice movement and the dangers of green capitalism. The participants agreed that capitalism is the problem and therefore green capitalism can’t be the solution. There was an upcycling event on a Sunday afternoon and the Cars of Hope collective spoke about their mutual aid projects with refugees on the Balkan route. On the 100th years anniversary of the murder on Rosa Luxemburg we read her letters from prison and people of Aktion Unterholz came to present their new brochure about their actions in Hambacher Forest. On a snowy afternoon a teacher came with his whole class in the Info-Café. We discussed the gentrification process in the neighbourhood and the Info-Café project. We also spoke about the Marien 41 squat and squatting in general and why we had to rent the space for the Info-Café. There were some good questions about police violence during the two evictions of Marien 41, the fact that the neighbourhood is a so-called “Danger Zone”, where the police has extra powers, and we also spoke about the new police law. It was great to have so many school kids in the Info-Café and to speak with each other. Personally I think these one of the reasons why I am actively involved in the Info-Café. But there was a quick response. Many young people of the so-called “Fridays for Future” groups reacted furious and announced that they would continue with their protests and strikes and Ende Gelände called for a week of action. On January 27 the coal harbour in Hamburg was occupied. During my improvised spoken word performance I spoke about the next day. On February 1 the Coal Commission officially presented the results of the negotiations that took place in the past months. I spoke about the reactions of the captains of industry when they saw that instead of representatives of the environmental NGO’s, a tree from Hambacher Forest came into the room. “What is that tree doing here and where the hell are those greenies?” The tree answered “Well desirable is not enough! You can’t compromise with the climate and I can’t compromise about being cut or not.” It became clear that the greenies couldn’t make it. Their train arrived too late in Berlin because some trees decided to fall on the electricity cables above the tracks before their trains would have passed that section. It was great evening on the last day of the month and we have 11 more months to go in 2019. 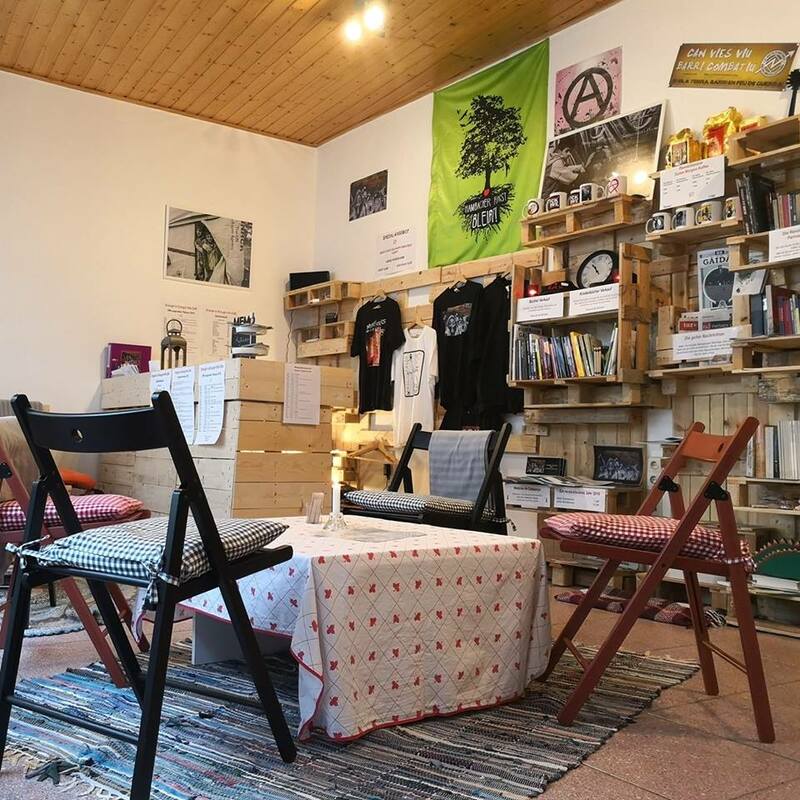 Tomorrow (February 3, 15:00, Wiesenstraße 48, Wuppertal, German territory) we have an open prepatory meeting for an anarchist bookfair in Wuppertal and there are more and more proposals for self-organized projects in the neighbourhood. The resistance against fascism and the formation of the authoritarian state will grow, and of course the actions for climate justice will continue.